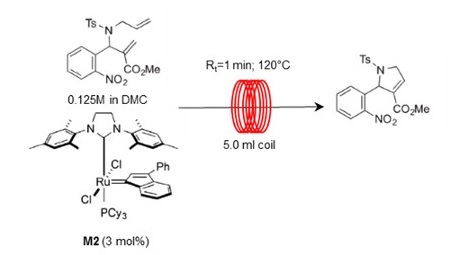 Uniqsis has published details of a new flow-through protocol developed by the Lamaty Group at Universite de Montpellier (France) on a FlowSyn™ Multi-X system that provides efficient ring closing olefin metathesis. Olefin metathesis is an important reaction that provides a useful synthetic route to highly functionalized molecules such as drug precursors or polymers. Although this reaction is highly efficient in batch, scaling-up usually results in poor reproducibility. While several research groups have reported the development of olefin metathesis in continuous flow, most of them have focused on the use of a heterogeneous catalyst, which currently show limited recyclability. Application Note 31 describes how the Lamaty Group (http://www.greenchem.univ-montp2.fr/page8/page15/FL.html), employing a Uniqsis FlowSyn™ Multi-X flow chemistry system, has achieved use of a homogeneous catalyst in an environmentally-friendly solvent, to bring ring closing metathesis of olefins one step closer to scale-up at the industrial level. In the application note the authors demonstrate how this reaction system is well suited for continuous flow implementation as short reaction times, elevated temperatures and high conversion can be achieved while using dimethyl carbonate as a solvent.